Holistic Wisdom can meet all of your gift giving needs. We provide gift wrapping for our products so that you can simply order and have your gift shipped directly to that special someone, saving time and making it easy for you! You may also type a personal message to the recipient which will be placed on a beautiful gift card attached to your gift. We will then box your gift in plain packaging and ship it discreetly to you or your recipient. It's that easy! As always, we are open to special requests, so do not hesitate to contact us if you would like something extra special! 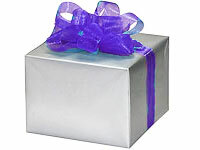 Adding gift wrap may delay your order shipping by 1 day to allow us extra time to prepare your order. You may request a desired color wrap and bow in the Special Order Instructions section during checkout. Otherwise, we will wrap it in purple paper with a purple ribbon.